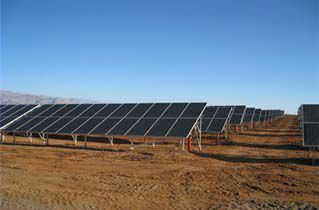 Recently,a large-scale PV plant usinginverters made by Sungrow Power Supply Co.,Ltd.in Chile announced that it had been in stable operation for approx.200 days by the end of March 2014. Located in Vallenar,this project was invested and developed by Chile State Grid Corporation with 3.15MW installation capacity intotal,and entirely using the 630kW PV inverters ,SG630KTL,from Sungrow.Gilded by the most mainstream technology,this centra linverter was one of those products with the high estsingle-machine capacity in the current global market,and was honored as“full of prospective”and“the new icon of PV inverter”since its debut in 2010.Numerous PV grid-connected projects chose this 630kW product with satisfaction owing to its high efficiency and superior grid adaptability. On account of its impressive records in China,SG630KTL stood out from this project leader’s PV inverter auditiont hrough out the world,and made its first step to overseas market. Asaworld-leading PV inverter manufacturer,Sungrow has been devoted to renewable energy power supply products forover 17 years and increasingly earned recognition worldwide,it is also worth mentioning that the company has been top1of Asia regarding PV inverter shipment for several years.This Chilean project means Sungrow won its first triumph and officially entered into this South American market after successfully madeits way to many other emerging PV markets. Sungrow Power Supply Co.,Ltd.manufactures power supply equipment for solar PV and wind power projects,including PV inverters,wind power converters ,and distributed power supply.The company also provides development,construction,and operation management for renewable energy projects.Founded in1997,Sungrow employs approx.1,000 people globally.By Q42013,Sungrow has over 7,000MW of inverters installed worldwide.According to IHS/GTM Research,Sungrow was ranked the 3 rdlargest PV inverter manufacturer in the world in 2012 by MW shipped.